Becoming a VMware Certified Professional (VCP) is your first step toward gaining expertise in virtual infrastructure and the industry recognition that follows. This certification is designed to teach you what you need to successfully install, manage and deploy VMware vSphere 4. 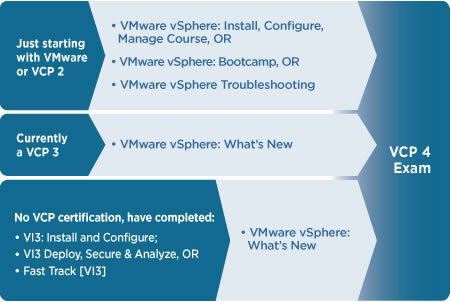 A VMware authorized instructor-led course is required. 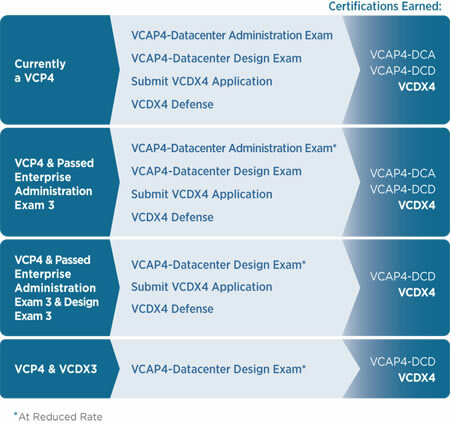 The VCAP4-DCA is directed toward System Administrators, Consultants and Technical Support Engineers who can demonstrate their skills in VMware vSphere and VMware vCenter technologies in relation to the datacenter, as well as their knowledge of application and physical-infrastructure services and their integration with the virtual infrastructure. VMware no longer requires qualifying exams to be taken in a specific sequence. However, required exams must be passed before the submitting the VCDX4 Application. VMware offers world-class Desktop certifications designed to validate and recognize individuals with the technical capabilities and real-world experience needed to increase efficiency, reliability, and availability when delivering desktops from the datacenter as a managed service. The VMware Certified Associate 4 – Desktop (VCA4-DT) is the first step toward gaining expertise in desktop virtualization and earning the respect and recognition that comes with being VMware Certified. The exam is designed for Desktop System Administrators who seek to demonstrate their ability to manage, monitor and troubleshoot desktop deployments and VMware View components, as well as their knowledge of adjacent, complementary technologies to VMware solutions. VMware Education recommends the listed courses in preparation for the VCA4-DT exam but there are no course requirements in order to take the exam.